Robinson and Clement bending a bit to make the writer appear taller because that is what true gentlemen do. 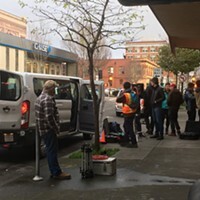 UPDATE: Official confirmation has finally come from the Humboldt-Del Norte Film Commission regarding the famous folk we've been seeing around Eureka. In a press release this morning, Cassandra Hesseltine, who's kept contractually mum up until now, stated that Jemaine Clement, Craig Robinson, Aubrey Plaza, Emile Hirsch, Matt Berry and Director Jim Hosking were all in town to film An Evening with Beverly Luff Linn. (This is not the title we previously reported after getting it from a source who shall remain nameless and whom we are not judging because Humboldt weed is strong, people, and out-of-towners need a little slack.) No word yet on when this comes out but we'll keep you posted. Shameless and a little lazy, honestly. 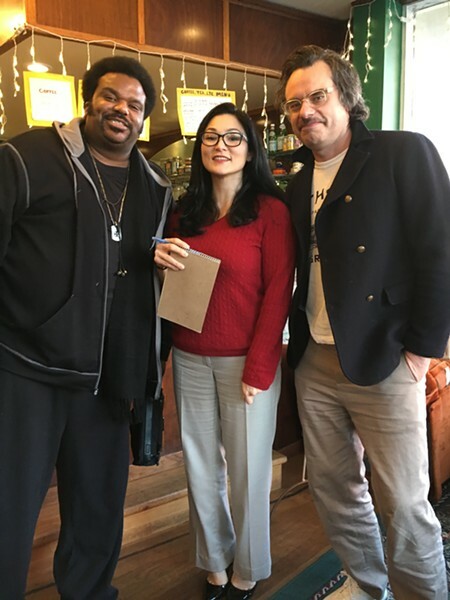 Actors Craig Robinson (The Office, Hot Tub Time Machine) and Jemaine Clement (Flight of the Conchords, What We Do in the Shadows) were right downstairs from the Journal offices at Because Coffee today, after all. The two are in town, along with Aubrey Plaza, filming an indie film directed by Jim Hosking (The Greasy Strangler) called Lena Left Lynn. 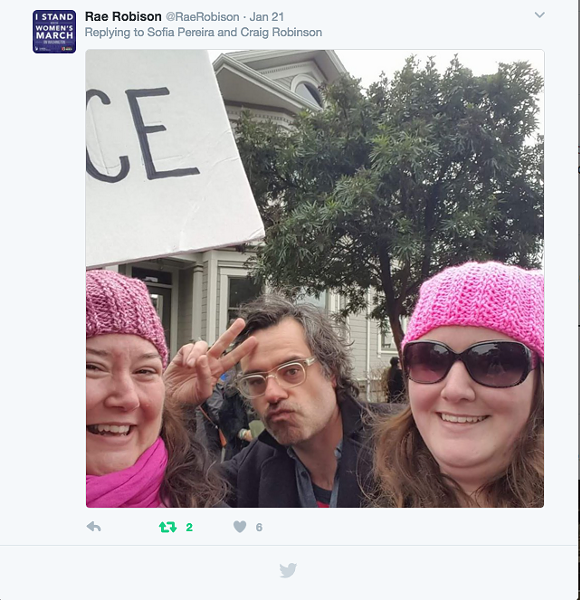 Rae Robison and Megan Johnson snap a selfie with Jemaine Clement at the Eureka Women's March on Saturday, Jan. 21. Both Robinson and Clement are enjoying our fair county — Robinson even snapped a sweet photo of an elk up at Prairie Creek — and say they're impressed by its arts scene. Clement, who hails from New Zealand finds our verdant coastal landscape familiar and other than the odd journalist (ahem), everybody's been pretty cool. Eureka City Councilmember Kim Bergel stopped by the coffee shop with her son, with whom Robinson posed for a photo. She also took the one above — which they insisted I had to be in. Clement also joined the Women's March in Eureka this past weekend (Robinson had to work) and was impressed by the turnout.